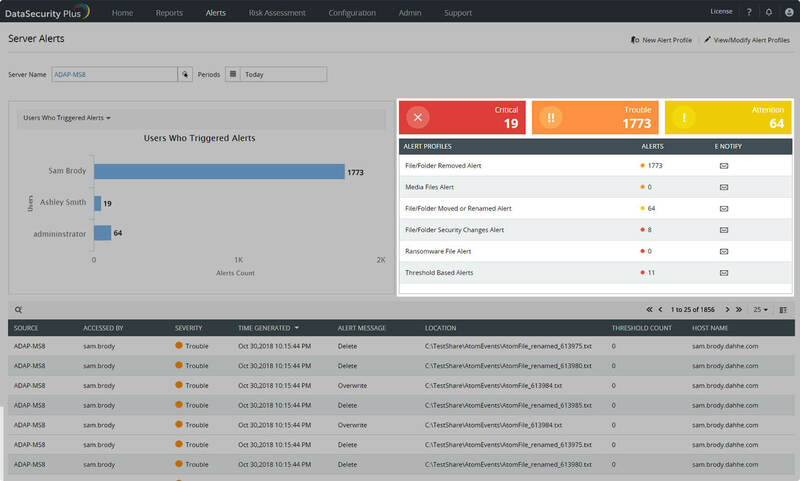 Detect and respond instantly to anomalous file activities and security incidents, such as ransomware attacks, with real-time alerts and customizable incident response. Why should you track file and folder changes? File servers are constantly at risk of internal and external attacks. Data breaches have the potential to cause massive damage to organizations, particularly due to how difficult they are to detect. According to a study conducted by the Ponemon Institute in 2018, the average cost of a lost or stolen record is $148. Whether it's caused by negligent privileged users or deliberate leaks by insiders, data breaches and critical file activities require a solution for instant detection and response. against data breaches with a file change tracker that detects data loss and malware intrusion. breach in less than 30 days saved over $1 million compared to those that took more than 30 days. cannot be changed without generating alerts. Detect suspicious user activity by triggering alerts when there is an abnormal increase in access events. Safeguard sensitive files by assigning threshold values to user-generated events. Limit the damage caused by insider threats. Spot privilege misuse and unusual activity on critical files with real-time alerts. Instantly detect infiltrations with telltale signs like sudden spikes in file activities, or with our repository of known ransomware. Isolate corrupted machines and halt the spread of ransomware. Automate responses to critical events. Save crucial seconds by automatically running custom scripts to shut down servers, end user sessions, disable accounts, or respond to security breaches according to your enterprise's needs. Real-time alerts for file, folder, and permission changes. Detect and respond instantly to access anomalies and security incidents with DataSecurity Plus. 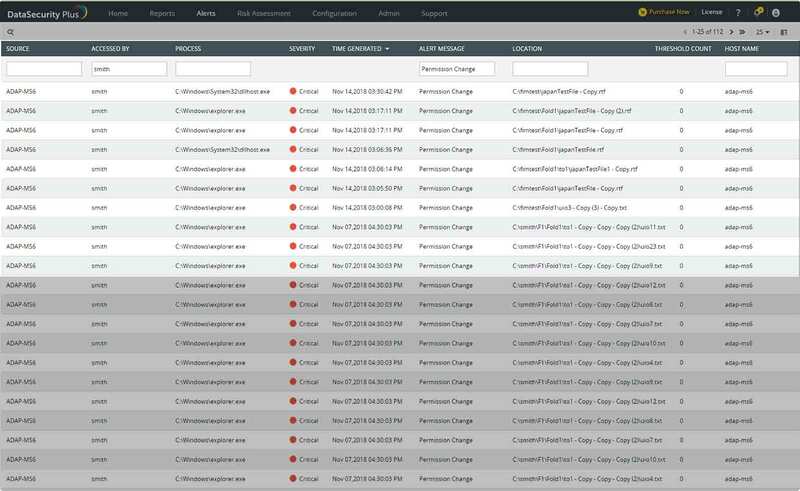 Speed up incident detection with default alerts for malware, access anomalies, or other significant events. View severity-specific event counts and get detailed reports for each. 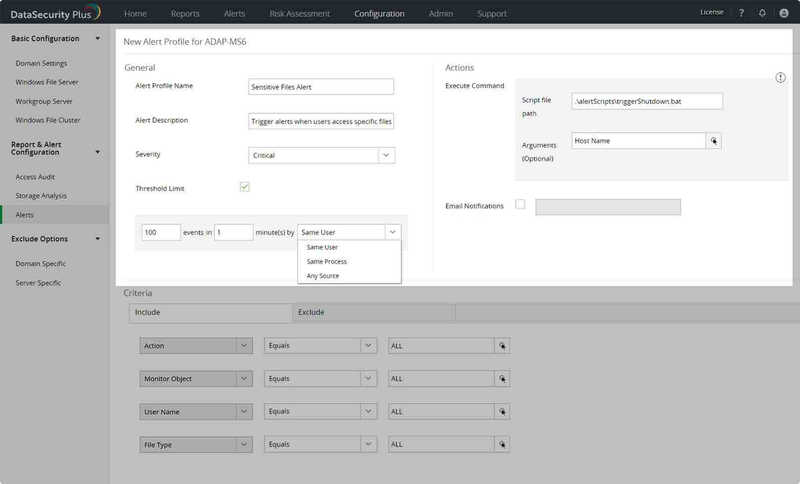 Find breach sources by filtering reports according to your needs and analyzing each entry. Promptly locate infected files and respond accordingly. Identify anomalous activities and non-compliance effortlessly. Ease analysis by searching for events triggered by specific users or sources. Set alerts for specific events. Monitor critical files and folders, and get notifications when a user modifies them. Define what's abnormal to you. Receive alerts when file servers record a suspiciously large number of activities by establishing safe limits unique to your enterprise. Automate responses to security incidents. Disable compromised user accounts, shut down infected devices, or create your own response strategies as per your enterprise's needs. Windows file change notification tool. Get DataSecurity Plus easily installed, configured and running within minutes.